There is no point in making New Year’s resolutions and then finding at the end of the year you have forgotten them. At the end of 2017, I wrote about the benefits of learning a new language, mused about the prospect of swimming regularly at the pool in Askeaton, and told myself that my New Year’s resolution ought to be to get my daily walking average that year of 3.7 km up to 4 km in 2018. Sadly, I never got around to learning that new language, I never did anything about swimming regularly in the pool in Askeaton, and my daily walking average last year stayed at 3.7 km up to 4 km in 2018. But I did keep a promise to myself at the start of 2018 that I would continue my regular walks on beaches and by rivers, that I would visit at least one new place each month. 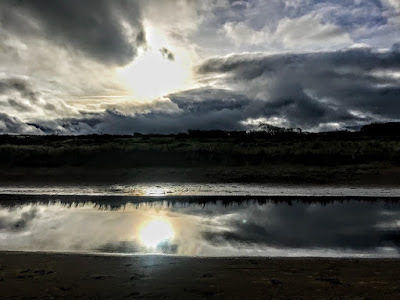 The year came to a close with walks on the beaches in Bray, Co Wicklow, late yesterday afternoon [31 December 2018] and at Beale Strand and in Ballybunion, Co Kerry, on Sunday afternoon [30 December 2018]. 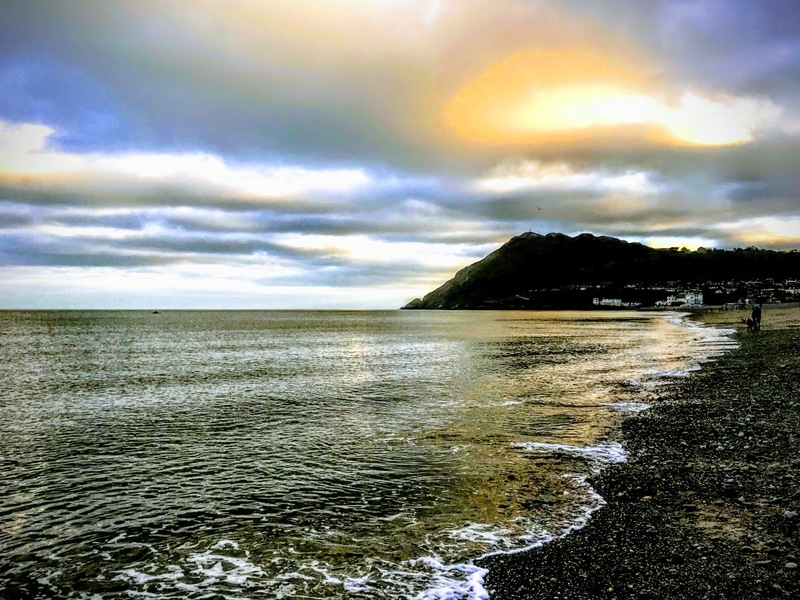 It had been five or six months since I was in Bray for a walk on the beach, but Bray was as busy on New Year’s Eve as it might have been on a cold summer’s Sunday afternoon. The low setting sun in the west, behind the Dart line, was casting its rays onto the sea waters to the east, with unusual lights on the waves and on Bray Head, while two rowers worked earnestly on a lone boat near the horizon. As the sun continued to set beyond view, two of us went to Carpe Diem for a late lunch, to rekindle memories of good meals in Italy, and to explore their interesting array of wines. On this occasion, lunch was accompanied by a glass of Albente from Campania. Albente is 100 per cent falanghina, an ancient variety known to the Romans, and grown on the chalky soils around Tufo. A short stint in stainless steel preserves the bright fruit, including delicately perfumed pear and citrus blossoms fill this voluminous wine, lively with acidity yet steady with pear, almond, fig, light straw, subtle honeysuckle. Mediterranean spices cling to the finish. 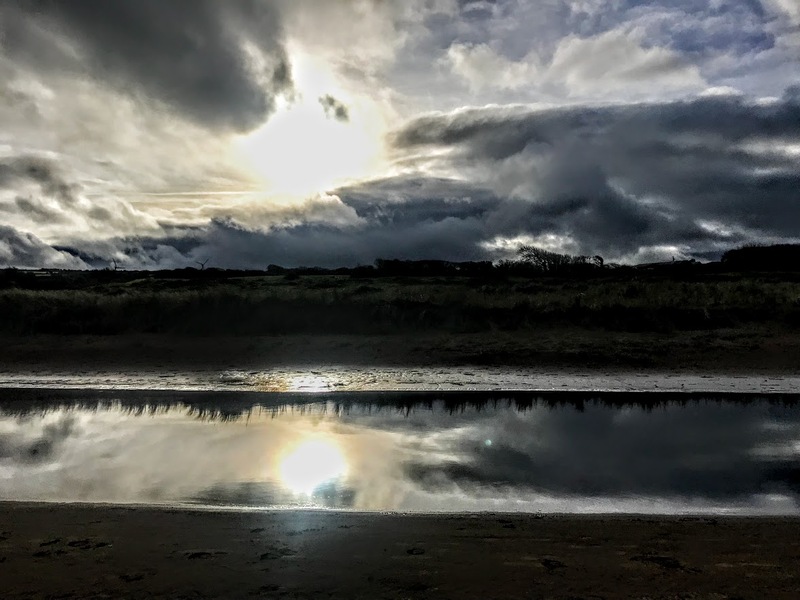 On Beale Strand, between Tarbert and Ballybunion in north Kerry, a small family group was creating quite a stir on Sunday afternoon with children on scramblers – presents that were obviously not intended to bring peace to all at Christmas. I noticed that Kerry County Council also encourages drivers to park on the sand. The same attitude from Meath County Council has caused serious damage to the beach at Bettystown. 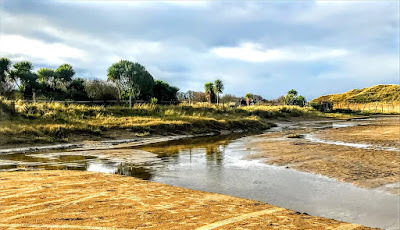 However, there was enough stretch of sand to go for a long walk on Beale Strand on Sunday afternoon, and in places there was a Turner-like quality to the views, with rustic countryside bathed in the winter sunlight, and small brooks flowing gently into the sea. From Beale, we continued on to Ballybunion for lunch in Daroka before a walk along the cliff edges above the beach. The extended weekend leading into New Year’s Eve seemed to have attracted a large number of families to Ballybunion on Sunday afternoon, despite the rain and even though all the mobile home parks seemed to be closed. 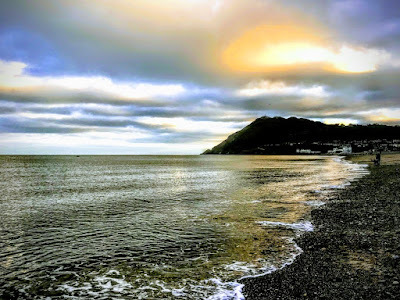 In Bray on Monday afternoon, the sun was setting on 2018. Perhaps I should not make too many promises to myself for 2019 … apart from continuing my walks along beaches and by river banks, and trying to visit one new place each month. On second thoughts, though … it would be nice to be able to speak Italian and rewarding to be able to read Dante in the original.